This week I had a great origami day - I found Origami For the Connoisseur, by Kunihiko Kasahara and Toshie Takahama at a used book sale (for $3.00CDN), and then when I arrived home I found that my copy of the Between the Folds DVD had arrived. The Between The Folds documentary is great - beautiful, inspiring, informative, and the accompanying short piece, Origametria, would make a great short video to play at a school math department meeting if you want to get teachers fired up about using origami with their students. Between The Folds brings to light much of what draws people to origami, and I think that, for those not familiar with modern paper-folding, it will contain many surprises. The images of origami tessellations are particularly beautiful, and the more representational origami 'sculptures' that are presented are often incredibly detailed. A main focus of the film was the tension between origami technique and artistry. For Robert Lang, there is no conflict between the two - technique sometimes dominates over artistry, but ultimately artistry assimilates and employs technique. At the same time, it seems that Eric Joisel fights an internal struggle to resolve his need for artistic expression and the temptation to focus on technique. Although the conflict, or potential conflict, between the artistic and technical sides of origami is a concern for the practitioners who are at the summit of the art form, I find that neither artistic expression nor technical complexity are important to my own experience of origami. Perhaps that is because I lack both artistic and technical talent. I was encouraged, however, by how Paul Jackson, Erik Demain, and Tom Hull were all manipulating very simple (yet beautiful and interesting) models as they spoke about origami. 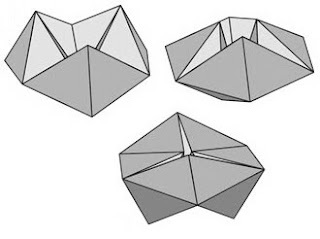 Paul Jackson contemplated some 'single fold' models, and both Erik Demain and Tom Hull were seen manipulating a hyperbolic paraboloid (instructions for this simple model by Demain are here, and Hull has instructions on page 65 of the handouts for his book, found here). Something that is simple and duplicatable too is another origami ideal. A very simple modular origami model for "rotating tetrahedron," designed by Tomoko Fuse, shares the same pages with the quote above. This model is an intriquing toroidal structure of linked tetrahedrons that has been studied by engineers and chemists (see for example Simon Guest's symmetry page and paper). The rotating tetrahedron and hyperbolic paraboloid are examples of the surprising yet simple models that make origami an accessible and beautiful way of exploring mathematics (see this earlier post for other origami-math links).